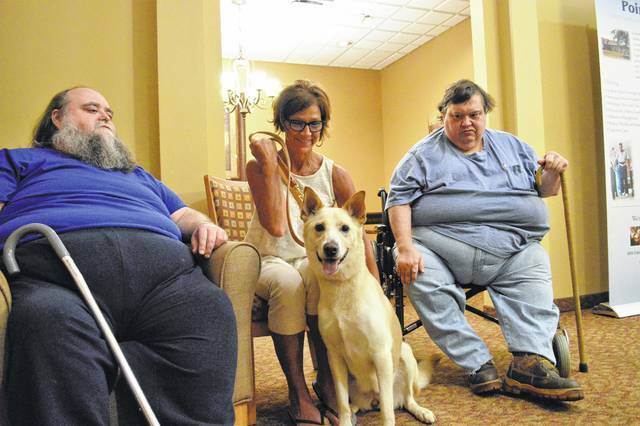 Larry McKenzie, left, Joyce Merrick, and Steve McKenzie pose with their dog Sally. The McKenzie brothers owned the dog for all her life until Jan. 8. The two were admitted at OhioHealth Grady Memorial Hospital in Delaware where they met Merrick, a nurse at the facility. The three agreed for Merrick to foster and adopt the dog. Sally’s family has grown since the end of last year. The white German Shepherd will celebrate her eighth birthday in October with her new owner, Joyce Merrick. The two crossed paths after Merrick, a nurse at OhioHealth Grady Memorial Hospital, admitted the dog’s original owners to the hospital. Steve McKenzie went to the hospital for kidney-related problems, while his brother, Larry McKenzie, was admitted for heart issues. Both were transferred to an assisted living facility in Centerburg until their housing needs were met. Merrick, who has been at Grady for more than four years and with OhioHealth for about 13 years, usually asks patients if they have an animal at home to help build rapport and ensure the animal has care. She learned about Sally from Steve McKenzie. The dog was left home alone with plenty of food and water for four days, he told her. But a permanent solution was needed. Merrick and Steve McKenzie came up with the plan for her to foster the dog through the Delaware County Humane Society. Merrick, who volunteers at the animal shelter, said the process was flawless. But Sally did not easily transition to her new home. “One day when I came home, my curtains were down, bed sheets shredded; she had accidents from one side of the room to the other, torn her metal cage apart,” Merrick said. She consulted with veterinarians who supplied medication to help Sally adjust. “After a while, we started to see some changes, way better, but (she) needed some manners around other animals and really in general,” Merrick said. Sally is now in a program to improve her socialization with other dogs, she said. The McKenzie brothers are thankful for Merrick’s help. “We thank her for doing it; don’t know what we would have done without her for sure,” Larry McKenzie said. Due to Merrick investing in Sally’s training, the brothers agreed for her to adopt the dog. But it guarantees that Sally will remain a part of their lives. Merrick plans to have Sally visit the brothers twice a month. “I know if I keep her, she will be able to have a relationship with her former owners,” she said.